Quite some time ago I bought the new “mushroom” part that’s needed to go to a 2,000 hr TBO. What’s involved in installing it? Is it just a matter of pulling out the little ball and inserting the mushroom instead? I vaguely recall someone mentioning a different spring, but I only see one listed. I did a quick search for the ROTAX SB concerning it with no luck. Actually it is not the mushroom that needs replaced to extend TBO. It is #3 and #5 the spring and cap. The mushroom can also be replaced if you have fluctuating oil pressure. You do need to replace both the pressure spring and the end cap with the new design. AFAIK, they no longer make the pre-2011 parts, so anything you buy from current inventory will satisfy the 2000 hour TBO requirement. Replacing the ball with the mushroom is not required (though some people have experienced oil pressure fluctuation, which the mushroom seems to cure). And, this mod only applies to the new crankcase design. Any crankcase s/n lower than 06.0010 is not eligible for the TBO extension. Eddie, when you open up the pressure relief valve assembly, be sure to perform an oil system pressure purge before starting the engine. There is a Service Instruction for that on rotax-owner.com. Thanks to you both. I thought it was just the mushroom that needed replacing. 1) I’m about to have the 5-year rubber parts replacement done. Seemed like a good time to make the swap. The system obviously needs purging at that time regardless. 2) Or, with no oil pressure fluctuation problems in 11 years, I could just leave well enough alone and save at least $50 in additional parts. Doing the math, if I keep flying at roughly the same rate - 500+ hours in 11 years - I’ll be 90 (!) by the time I hit 1,500 hrs and it becomes an issue. If I’m even still flying then - I hope so - I can worry about it then. But, “wisdom of the crowd” and all that, what would you do? if I keep flying at roughly the same rate - 500+ hours in 11 years - I’ll be 90 (!) by the time I hit 1,500 hrs and it becomes an issue. Rotax TBO involves two numbers, Hobbs (not tach!) hours and time in service. The latter is often overlooked. I believe yours is 12 years (you'll have to check the engine s/n against the list in the Service Bulletin to be sure). If so, you're now 1 year away from TBO, regardless of hours flown. Compliance with the SB brings your TBO up to 15 years (buying you only an extra 3). Now, before you panic, TBO is not regulatory, merely advisory. And since yours is an Experimental, you can probably be justified (and safe) in ignoring the 12 year limit. So, if you choose to stop reading here, nobody's going to blame you. Still with me? Then consider that I'm in a different situation. As a commercial operator, I'm subject to both scrutiny and legal liability. For me, the calendar limit is potentially serious. This is one of the reasons flight schools tend to turn over their fleets with some degree of regularity. When I did mine Lockwood had a "kit" for about $60 I think. I didn't have any oil pressure issues but wanted the extra TBO tacked on. Mine is also a 2007 engine. I figure it cost me about $0.12 for each hour added. "Now, before you panic, TBO is not regulatory, merely advisory." This is back in FAA legal as we speak and has been for 4 months. I still may take 1.5 years for them to render a decision. This has been in legal twice now. This could stay on condition or it could change. Time will tell. This hinges on 1-2 words. Rotax "Service Bulletins" that are labeled mandatory are also fast tracking through the system and these may be mandatory soon. These may be mandatory soon. This will be their 2-3 time through legal. roger lee wrote: Rotax "Service Bulletins" that are labeled mandatory are also fast tracking through the system and these may be mandatory soon. I don't understand why FAA Legal has to be involved in this one. If Rotax wants to force compliance, under present rules all they have to do is issue them as Safety Bulletins rather than Mandatory Service Bulletins. Those already have the same force of law as ADs. Rotax can't force compliance. That would have to come from an airworthiness directive or safety directive from the aircraft manufacturer. That's my understanding as well. The engine is just like any other component or part; the component manufacturer can make recommendations, but only the *aircraft* manufacturer can make it regulatory by issuing a SB or AD. I think this shows the limitations of attempting to follow the “Most Conservative Action” rule. On the one hand, The Most Conservative Action in my case is obviously to do nothing, along the lines of “If it ain’t broke...” or “Leave well enough alone”. Messing with it just provides an opportunity for a Maintenance Induced Failure, with no perceived immediate benefit. On the other hand, The Most Conservative Action in my case is obviously to follow the manufacturer’s recommendation, and to makes sure my engine has the most up-to-date parts, which they hold to be an improvement over the ones currently installed. I think my tendency to fall back on the first option was brought up in my recent fuel pump thread, where we learned the term “Status Quo Bias”. I’ll probably go ahead with the second option, when the system is opened up anyway for the oil line change. That way I won’t have to worry about it when I’m 90(!). 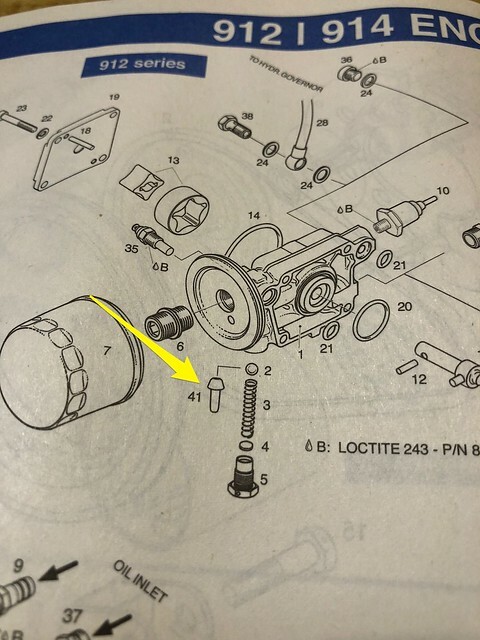 To be clear, I would also need to order the spring and “plug screw”, items #3 and #5 respectively in the above diagram, right? What about the shim, #4? FastEddieB wrote: Thanks for all the input. When I did mine, Roger Lee told me the shim was rarely needed unless there is a problem. IIRC I ordered the three parts needed as a kit, but I might be misremembering and have ordered them separately. I would not consider installing the shim, unless I had low oil pressure verified independently by a mechanical gauge. The shims are used to adjust oil pressure to the desired value. I always keep a few in stock. They're seldom required, but occasionally an oil pressure regulator may require 1, 2, or (seldom) even 3 to meet target pressure. I'm probably going to order the parts this afternoon. First, I want to check my logbook to be sure Roger didn't maybe do it at the last hose change.